I'm sorry about Ernie. Rest well sweet pig and watch over your special little girl. Pixie and Bear are welcome to be our permanent guests :-). Maybe Fairy should have married Snowman, but sadly this will not happen anymore. Condolences to Fairy for the loss of her daddy, Ernie. 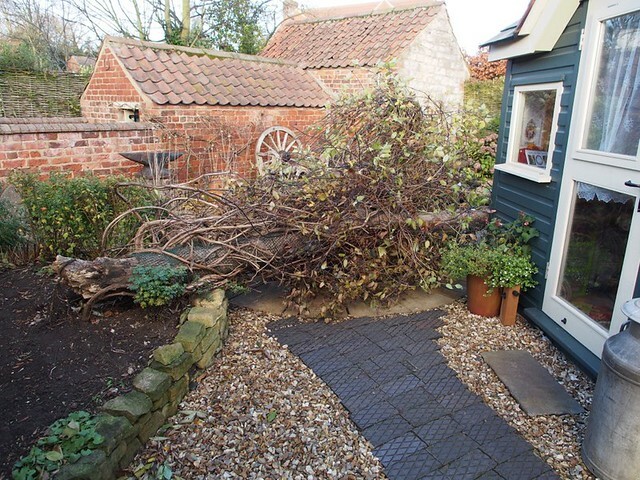 A tree blew over in the garden today - it just missed The Piggery and the small tree (behind it)! That's Fairy-Magic for you! I hope everyone in the UK is safe, the winds were pretty strong here today and it looks even more worrying for the east coast and in Scotland. Oh dear! Were the girls all a-twitter? Or were they inside at the time? They'd just had their lunch, AldenM1, in the Piggery! I didn't hear the tree fall because of the overall noise of the wind! I'd only been out to check them about half an hour before though. A lot of the coast around Norfolk has been affected. Keep safe, MaddyHarper. I was just checking in to see that you were safe and dry! I'm glad the tree missed the piggery! What a scare. It's been really rough up here in Scotland. One of my mum's neighbours had her car wrecked. The windows on it were smashed and there are holes in the roof. Some people have even found trampolines in their garden that weren't there the day before. I've been worried about you, wibster1, sorry to hear about your mum's neighbour's car. There are trampolines in the road etc here according to the local news. We are ok but a lot of roads are closed a few miles away, flooded and lorries overturned. Ian has to go down to Berkshire today but has said he will turn back if he has any doubts about safety. It said on the news the high tide today would be even more destructive. Just checking in after all the bad weather, glad to see everyone in the Fairy household is safe and the tree missed hitting any important things! Yikes! Glad the Fairy Magic worked! Thanks Mildred. Hope Ian got to and back from work safely. A few years ago we had really fierce winds where we stay and it was New Year's Eve. We had just completed an extension on the back of the house and were happy with how it turned out. We had sat down to have a drink before maybe going to a party at my next door neighbour's house. The power lines outside the house were sparking as it was so wild and I had told my husband it wasn't safe to even go next door. I was staying in with my piggy George and didn't want him to go out either. The next thing I heard an almighty noise and the roof on the extension ripped right back and caught the vent on the boiler bursting it and leaking gas into the back of the house. The rain was pouring into the extension. I grabbed wee George and ran to the front of the house to get him to safety. I phoned calor gas to let them know what had happened and the guy I spoke to said we were lucky the house hadn't gone up and finished with Happy New Year! Needless to say a few more drinks were had that night as we had no heating either!! The trampoline video is hilarious with the commentary. Mildred, glad all the pigs are safe. Have a lovely holiday season! Oh Mildred, I'm sorry about your tree, but glad it was no worse. Yikes, that was a little close for comfort. Hope you enjoy the Christmas market WITH the lights tonight, Poppycorn! That sounds awful wibster1, thank goodness everyone was safe. Scary stuff.